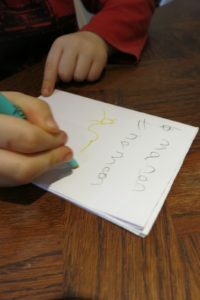 There’s a lot involved in writing – children need to know how to form each letter, think how words might be spelt, how to set them out on a page AND have something they actually want to write. Extra practice at home can really help children make progress and gain confidence but this needs to be something they want to do, ideally a part of everyday life or imaginative play. Some of this may be linked to stories and you will see that we have tried to link reasons to write in with our activity pages. Here is some advice and ideas for helping your child become a writer. 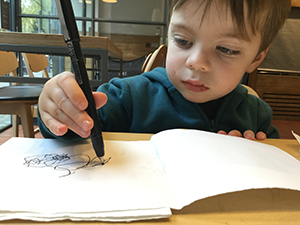 For very young children, lots of experience with drawing shapes with their fingers, brushes and scrapers can really help them develop the skills they need to use a pencil or pen and to practise the movements they will need to make when forming letters. NB Very young toddlers explore with their mouths and are likely to want to eat shaving foam, or crayons at first! Most schools have a policy about the particular handwriting style they use. Try to find out about this. They may have print outs of the alphabet in the school style that you can have to refer to at home. Composing ideas is an important part of being a writer. Have fun making up stories together, this may be based on a story you both know or be something completely new. Write down your story and read it to your child, this will give them a feeling of pride that something they have made up or helped to make up has been written down. Some children may have lots of ideas of their own, some may want to retell stories they know really well. To be confident about writing children need to have lots of practice and to have something they want to write. It is more often much more fun to write in a mini book than on a piece of paper. These can be made very simply. See here for our instructions for making simple folded paper books. Make a selection in different sizes and colours. Children can use them to write a story they make up or already know, to draw their favourite story characters, toys or the people in their family. For a display perhaps an ‘exhibition’ of toy dinosaurs with labels for each or of animals in an imaginary zoo. Choose a selection of photos, about the family or a holiday or special event and make an album. Children can compose and write captions for the photos. Children could also do same thing with a scrap book of pictures cut out of magazines. My daughter is in reception. My question is how much to intervene with her writing at home? If she writes something it is likely to have capital letters in the middle of a word or letters formed incorrectly. If I just leave her to write in some ways it reinforces the mistake but if I try to show her she doesn’t want to write anymore! You may not be able to read what your child has written but if you can’t, ask them to read it to you. It is good to find the time to talk about what they have written straight after they have done the writing if possible or as soon as you can, otherwise they might forget what they were trying to say. You are likely to see lots of mistakes but try to resist the temptation to point these out while they are writing, unless you are asked for help. It is really important for children to have a go themselves. Try to look for what’s right in children’s spelling attempts rather than focusing on what’s wrong, praise the words spelt correctly and the words your child is close to spelling correctly. Show them they are nearly right and point out the tricky part – writing down the word and underlining or circling it. If you can think of other words with the same spelling pattern write them too so that children see there’s a pattern. Children may not be sure of the capital and lower case versions of each letter and may muddle them in words. Find reasons to write yourself so that your child can see what you are doing – talk about it while you do it eg I’m going to start with a capital letter here because this is a name. Make an alphabet book – you could do this by making several zig zag books (see here) and sticking them together. Have a capital and lower case version of each letter on every page with a name ( perhaps of friends or family) and an object or animal to illustrate eg A for Anna, a for apple. Write the letters of the alphabet on small squares of paper to make a set of capitals and a set of lower case letters and play a matching game. You could focus just on the letters which children find tricky.